Take a second and think; how many of the things you use each day rely on electricity to operate? Things like your cell phone, laptop, tablet, and headphones probably come to mind. But, what about the basics like refrigerating food, lights, and heat? Its true, many of us in the wealthier parts of the world take access to electricity for granted. The good news is that the number of people that don’t have access to electricity is shrinking. 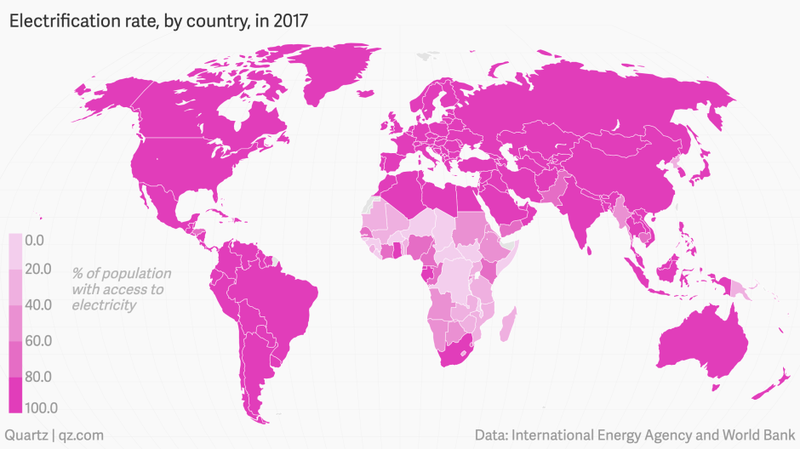 In 2018, for the first time ever, that number shrank to below 1 billion people according to the International Energy Agency. This was accomplished by countries taking great strides in providing access to electricity. For instance, India completed the electrification of all villages in early 2018, and plans to achieve universal access to electricity by the early 2020s. Meanwhile, in Indonesia, the electrification rate has now reached nearly 95%. The World Health Organization has emphasized how critical access to electricity is to overall health. Without electricity, there this no way to refrigerate vaccines or operate essential healthcare equipment. The good news is that renewable energy costs are falling. This means that providing clean energy to remote places is now a viable option. Many countries have already started installing renewable energy for their citizens. Laos and Nepal, for example, went from having nearly no electricity in the year 2000 to both being over 90% electrified in 2017.